Creating quality spaces for humans by focusing our resources on steel, earth and construction. We have been involved in various types of civil infrastructure projects, including building construction, river embankments, and expressway bridge pier building/construction works. We continue to provide innovations which incorporate attention to details and technical support backed by long years of accumulated expertise, to offer solutions or options suitable for individual projects. 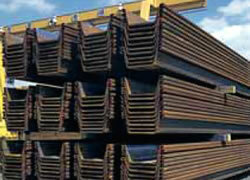 Hirose's heavy temporary steel materials are widely used in foundation work for civil engineering and construction projects. The materials include earth-retaining materials to support deep excavation, steel deck panels to maintain traffic flow in large-scale urban development and access platform within work sites, and other materials. 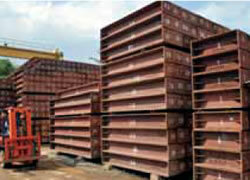 Steel sheet-piles are used as retaining walls in civil engineering and foundation works. As the size and length of the material can be selected to ensure that they are well-suited to the onsite conditions, optimum material can always be utilized with no wastage. 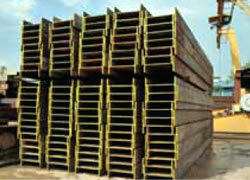 Used as Soldier piles in retaining wall system for civil engineering construction and foundation works where water tightness is not a major design concern; and as structural member supporting road deck panels. The main materials for temporary Earth Retaining System, these provide the stability in deep excavations. 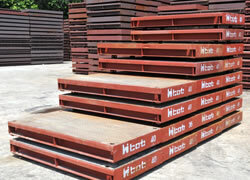 Steel decks are used to form temporary floor-surface as vehicular access for water or drainage projects where existing access are unavailable or restricted.